The weather is just right for dining al fresco. Dust off your patio and give it some spring cleaning to turn it into the place to be this summer. Whether you are updating your patio space or designing a brand new space, here are several outdoor dining patio ideas to inspire your outdoor space. Encourage hangouts on your patio by creating inviting spaces that are eye catching and comfortable. Consort Design gave this patio a sleek, contemporary look by sticking with clean lines and a black and white theme. The bar area pictured above is Instagram worthy, and the dining area, with long benches and tables, is just as beautiful. Fashion designer Dennis Basso’s home in the Hamptons has a cozy patio dining area decorated in his signature blue and white style. The ceramic topped table was handmade in Italy, and it is delightfully surrounded by white wicker chairs. The setting is just perfect for a spring party or an afternoon tea. Rustic decor may be more your style. The perfectly distressed and aged wood tabletop above looks beautiful next to the carved legs of the light wood chairs. 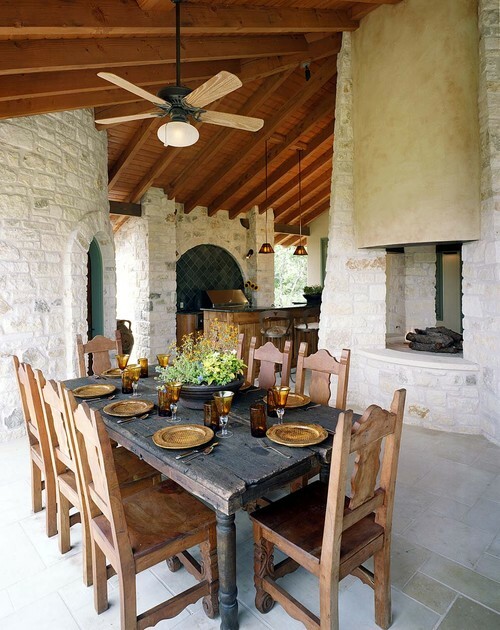 Use natural and unfinished materials to create a cozy, inviting dining area on your patio. I love the resurgence of Mid Century Modern style. The sunken patio in this Venice, California backyard has a very retro feel to it. A built in fire pit adds light and warmth to the nook. The wall of bushes helps make this patio dining space feel more secluded. Whatever your style, you can find inspiration for your outdoor dining decor! Create a patio space that you will not want to leave this spring or summer.